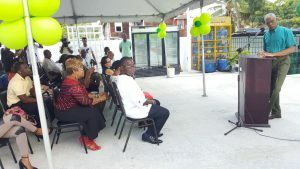 President David Granger (at lectern) addressing the forma opening of the Buxton Gas Station. Seated at the front row in white shirt is the station’s owner, Morris Wilson. 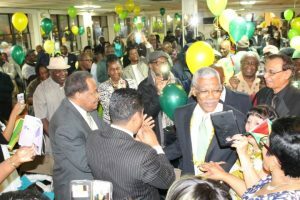 President David Granger on Sunday recognised the role of the Guyanese Diaspora in his election to office, but at the same time he called on them to stop writing and help develop the country. Addressing the commissioning of the US$400,000 upgraded Buxton Gas station, he dedicated small but significant parts of his presentation to highlight the importance of overseas-based Guyanese in his eventual election to office last May. “First of all, I love the Diaspora. I have great respect for them. Six years ago I launched my campaign that brought me to this podium today in the Diaspora and I am always grateful to them for what they did then and the confidence that they showed in me,” said Granger, a relative newcomer to public political life. The President reiterated the importance of the Diaspora in investing its capital, tremendous experience and determination to match local land and labour to develop villages. He called on overseas-based Guyanese to stop writing and take action. “We ask the members of the Diaspora to do more than talk and write but to put their money where their mouths (are) like the Wilsons (owners of the Buxton Gas station) and come and invest. If you love Guyana, come and invest in Guyana,” he said. Morris Wilson and his wife, Joceylyn, who are US-based Guyanese have invested about US$400,000 in rehabilitating and modernising the Buxton Gas station. FLASH BACK: Then Opposition Leader and Presidential Candidate, David Granger mingling with the Guyanese Diaspora in New York ahead of the May, 2015 General and Regional Elections. In clear reference to the group that had petitioned him with their concerns and hopes for improved relations, the President called on Guyanese at home to encourage the Diaspora to “invest in your communities” with technologies, industries and expertise. “When they want to send a petition next time, ask them to petition for a permit to open a factory or a farm. Tell them I say so,” he said. Granger acknowledged the need to build infrastructure to attract investors and industry. They include investment in education infrastructure and encouragement of youths to attend school. Granger’s comments came about two months after a group of New York-based Guyanese accused him of treating the Diaspora as outcasts and not affording them jobs and a stake in decision-making, although they had campaigned hard and mobilized funds for his election campaign. The group subsequently issued a petition threatening to cut ties with the Granger-led APNU+AFC coalition if steps were not taken to repair relations between government and the Diaspora. After the official opening of the Buxton Gas station, the Guyanese leader stayed around for several minutes, interacted with residents and took photographs with them. He has already rubbished accusations by the group of Guyanese that he has become elitist and o longer meets with ordinary Guyanese in New York. Another way in which the Guyanese Diaspora, he said, could contribute to Guyana’s development is by purchasing products made in the land of their birth. “It means that our Guyanese Diaspora if they turn around and support our local commodities would be able to make a meaningful contribution in that niche market in those places where they live,” the President said. 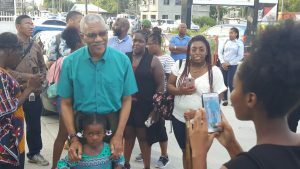 PICTURE OF A PICTURE: President David Granger and a little girl pose for a picture being taken by a relative of hers while others look on appreciatively at the Buxton Gas Station. The Guyanese leader praised the Wilsons for demonstrating faith in Buxton, one of several villages across the coast that more than 100 year ago he added had been the source of several agricultural exports to the Eastern Caribbean. “We were the food bowl of the Eastern Caribbean,” he said. The President, who is a historian, highlighted the important role of villages such as Leeds and Fyrish in massive agricultural production more than a century ago to the extent that they had fed immigrants and had been the source of planting material for places like Black Bush Polder, making it a significant food producer today. He called for innovation and the use of land in the quest of entrepreneurship to remove from waged labour.